After many sell out shows and top reviews, Khe Sanh have proven why they are the closest thing to the real deal you will find, and why they are regarded as Australia's ultimate Cold Chisel & Jimmy Barnes Tribute Show! The Khe Sanh show features all the classics such as Flame Trees, Choir Girl, Cheap Wine, Khe Sanh, Bow River, Rising Sun, Working Class Man, Driving Wheels, No Second Prize, Breakfast At Sweethearts plus many more including songs from Jimmy's ‘Soul Deep’ Albums. An evening with Khe Sanh never fails to engage the audience to sing along to their favourite Cold Chisel & Jimmy Barnes songs. With a wealth of experience, the Khe Sanh show features the powerhouse vocals of Andy Baker up front along with some of Australia’s finest seasoned musicians. 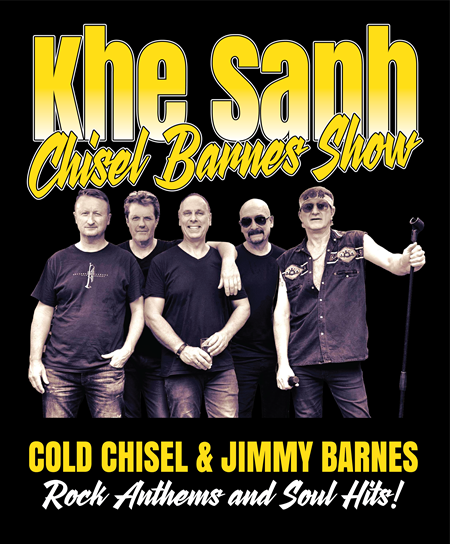 Khe Sanh is guaranteed to give you the ultimate Cold Chisel & Jimmy Barnes experience!